The conventional wisdom with projectors is that they’re cheaper per inch of screen size than a television of the same quality. While this is true, it doesn’t mean all projectors are cheap. Most that you’ll find will cost at least a few hundred dollars and can cost thousands, depending on the features. If you have a limited budget, it might seem like a projector is completely out of your reach, but that doesn’t have to be the case. It may take some searching, but you can find projectors that won’t cost a fortune and still give you a clear, reliable picture. The best projectors under 150 dollars are the ones that don’t try to do too much. Look for a streamlined model with a focus on resolution and contrast ratio. If you’re looking for more advanced options like 4K UltraHD or 3D capability, you’re not likely to find them in the price range, but that doesn’t mean you can’t find a high-quality projector. We’ve picked out our four favorites below. Check out the full reviews if you’re in the market for a quality projector on the cheap. 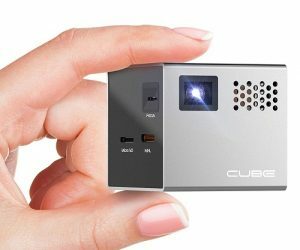 Here’s an excellent choice that isn’t just incredibly affordable but is also super-portable (>>> If you’re searching for such type projector might want to check this Lumi HD mini review). It’s basically small enough to fit in the palm of your hand, measuring only two inches on a side. This makes it perfect for traveling, or if you want the option of moving it easily from room to room, and can also be great for those who live in smaller spaces. That tiny package can still produce an impressively large screen, up to 120”, making it ideal for home theater use. The RIF6 Cube is compatible with a range of typical media sources, including gaming systems, streaming devices, computers or tablets, and even phones. It has MHL and HDMI slots (>>> Learn how to connect projector without VGA), along with a MicroSD slot for on-board content and a standard USB port in case you want to play straight from a flash drive. While it does offer a battery-operated option, you only get about 90 minutes of use out of it, so most people will be better served just sticking with outlet power. The good news is it comes with the charger, so there aren’t any hidden expenses before you can use it. That brings us to the picture itself. The resolution was better than we expected for the price. Though it doesn’t offer a full 1080p resolution, it’s still clear and a high enough quality that it won’t distract you from watching your program. Our only complaint about the image is the brightness. It only generates about 50 lumens, which in lay-speak means you can only use it in a completely dark environment. Aside from this limitation, we were very impressed by the picture and performance of this tiny projector. Many projectors you’ll find at this price point will use an LED bulb projector, and this gives them similar drawbacks to the model above: they’re not as bright and hard to use in rooms with ambient lighting. This projector uses a similar LED-style lamp but has taken the technology involved to the next level, making it about half again as bright as other bulbs that use the same design. It still won’t work outside in full daylight, mind, but it’s a lot more versatile to various lighting environments than other options. The display on this model can range from 50” to 130”, with movie projector clarity that makes it ideal for a home theater. It checks off all the boxes you’d expect for this application, including compatibility with a lot of different media sources. The color contrast is noticeably better than most of the options we reviewed. Combined with the higher brightness, it puts this at the top of our list for best projectors under 150 in terms of picture quality. The initial set-up for this projector is minimal, and we found it easy to get it set up and calibrated for the screen. The included remote lets you control your playback from anywhere. One advantage of the LED bulbs is that it generates almost no fan noise—you’ll still need to use external speakers, but at least the projector won’t stop you from hearing them. Overall, it’s an impressive value, especially considering the included accessories and long lamp life. This is an upgrade of a previous model in the company’s catalog. That projector, the T20, was a very popular option because of its affordability and accessibility. While it’s true it’s not always good to change something successful, in this case, they’ve made it even better with the T22, bringing you a brighter, clearer way to watch things on the big screen. Let’s start with the picture. It has stats that are comparable to what you’d find on projectors in the $300-$500 price range. It supports both 1080p and 720p screen resolutions and can give you a display that’s between 30” and 176”, depending on the distance. There are even some features here you might not expect to find on more expensive projectors. As an example, the quality of the onboard speakers is much higher than we expected. The quality is on par with laptop speakers and loud enough you might not need external speakers—usually a requirement for a projector. The quiet operation helps with this, too. For value and versatility, the T22 is an excellent option. Last but certainly not least is this projector from Erisan. It’s unique on the list in that it’s the only one that offers remote connectivity through either Bluetooth or Wi-Fi. It also has an Android 6.0 operating system, making it the smartest projector for under 150 bucks, and an ideal option for anyone who wants a projector that can integrate into a smart home system. Erisan didn’t sacrifice anything on the build quality to bring you this extra feature, either. The lamp is both bright and long-lasting. The 50,000-hour lamp life is more than twice what you’ll find in most home theater projectors, which makes this an excellent value in the long run. It gives you a range of screen sizes, from 34 inches all the way up to 180 inches, so it’s versatile for any space. This versatility applies to the connections, too. Along with the wireless options, it has the standard array of hook-ups, including VGA, HDMI, AV, and USB. The lamp isn’t the only thing in this projector that’s built to last. It has a remarkably solid build and is both compact and lightweight, making it an ideal option for backyard movies or RV travelers. The set-up is quick thanks to the smart operating system, and it’s also relatively easy to adjust for different spaces and media sources. Anyone who wants a smart projector at a great price will be happy with what they get from the Erisan 401E. 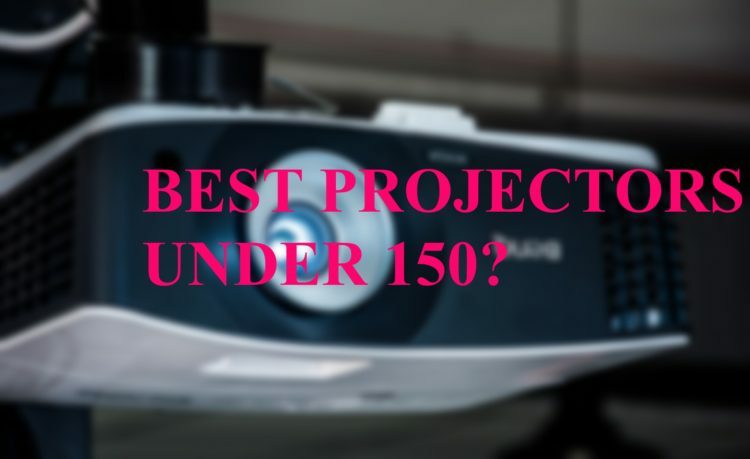 So what’s the best projector under 150? All four of the options above are great options if you’re looking for something in this price range, but if we were pressed to pick just one, we would have to go with the RIF6 Cube. It costs a smidge more than the other options, but you’ll get a lot for what you’re spending. (If your budget is even lower check this list of best projectors under $100) Considering that replacement projector lamps can cost almost as much as the projector itself, the long lamp life makes it an especially good long-term value. Whichever way you decide to go, you’ll get affordable big-screen entertainment right in your own home.